Abingdon’s Complete Gardening Services have been providing customers in Radley and the surrounding areas with the highest quality of garden designs for over 30 years. Some home improvements are quick and easy to do; but making sure your garden is just right is a patient process as innovative designs take time to blossom. Our highly knowledgeable experts consider how your garden design in Radley will mature over the seasons. Here at Abingdon’s Complete Gardening Services, we pride ourselves in offering customers bespoke garden design in Radley; making sure the potential of your outdoor space is fully realised. We look at everything from which types of plants will look best in your garden, right through to picking out the garden furniture to which best matches the design and budget. We’re based in Abingdon in Oxfordshire but we regularly work on garden design in Radley, Sutton Courtney and Appleford. Our specialist garden design services can of course be tailored to your needs, but we also offer landscape gardening, patio installation, turfing, fencing, and maintenance tasks. Any combination of these options and much more can be added to your new garden design, and we’ll work closely with you to make sure your new garden is glorious. 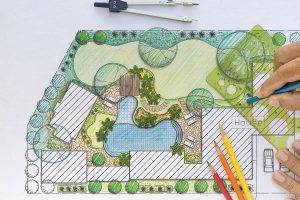 If you’re interested in having a new garden design in Radley, then please contact us today to speak to one of our friendly team. We offer a free no obligation quote as well as advice and measurements so you can see how your garden will look, before spending a penny. Take a look at some of our previous garden designs in Radley and other areas in our Gallery. Alongside the garden design service, we also carry out garden maintenance all year round, which (dependant on your needs) could include lawn maintenance, pruning, wedding and plant bedding.